Seeds Processing Machine is to make the oilseeds in the best condition for processing the more and more oil outputs. Seeds processing includes the following sections: Cleaning, Crushing, Softening, Flaking, Extruding and Drying. During the process of seeds processing, a series of seeds processing machine in oil processing plant or you can say seed processing equipment are necessary, such as cleaning sieve, crusher, seed softening machine, flaking machine, oilseed press, dryer and so on. Specially designed Nylon brushes to check sieve perforation clogging. Cleaning machines are to remove the impurity from the oil seeds. It can improve the oil output and protect the main seed processing equipment, usually it includes: Dust Remove, Stone Remove, Iron Remove, etc. 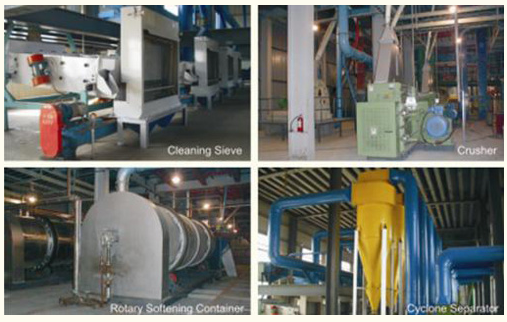 The seed processing machinery are: Cyclone, Cleaning Sieve, Stone Remover, Magnetic Selector and Iron Remover, etc. The crushing machine is to make the big size oil seeds into pieces to fit the coming flaking processing. Crushing section is very important and can affect the flaking process and improve the yield of oil. Crusher is the equipment to finish such process, it can process different oil seeds like peanuts, soybean , sunflower seeds, rapeseeds, etc. Softening machine is to adjust temperature and moisture to improve the elastoplasticity of the oil seeds, the lower oil yield oil seeds such as the soybean have to be softening before flaking, softening can reduce the stickiness of the flaking processing. To improve the flaking work environment and efficiency, while for some higher oil yield oil seeds processing they can omit softening but flaking directly after crushing. Flaking machine is to make the crushed oil material into flat pieces with certain thickness under the mechanical impact processing. Flaking is to broken the histocyte, enlarge the pressing or solvent extraction processing area of the oil seeds to fasten the oil come out from seeds. Our seeds processing machine can process all kinds of softened and crushed oil seeds, such as soybean, sunflower seed, cotton seed, rapeseed, peanut and castor bean, etc. Buy it today and make really money by yourself. Contact us now and we are always at your service.